On Sunday, September 28th, Poland’s Michal Kwiatkowski won the Road World Championships with a daring breakaway in the final kilometers. The 24-year-old rider from Poland bridged to a breakaway, then attacked out of that break to hold off a charging group containing many of the day’s favorites. 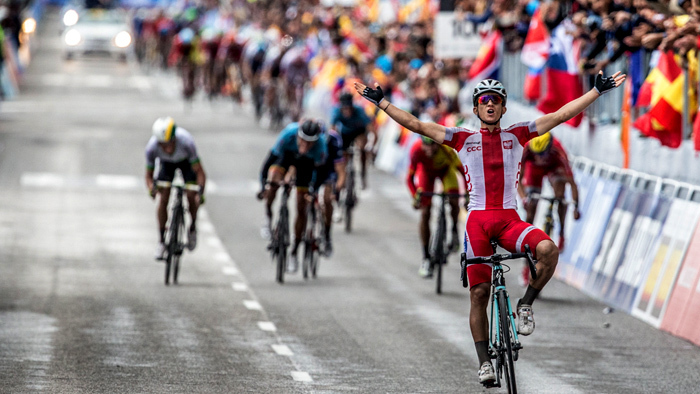 With the right mix of tactics and talent, Kwiatkowski was able to produce an amazing ride. Here is an inside look at the data from his Quarq for Specialized power meter over the 253km course and six and a half hours of racing. This file was provided to TrainingPeaks courtesy of SRAM and Quarq through the Omega Pharma – Quik-Step Pro Cycling Team. See his full Quarq power file. The 14 lap course of 18.2kms each had a total of 4,200 meters of elevation. Kwiatkowski’s Polish teammates did a lot of work in the early part of the race. In the first six hours and twenty minutes of racing, Kwiatkowski was well protected by his teammates, but he still did plenty of work. With 7km to go and a group of four riders off the front, Kwiatkowski set off on what would eventually be his winning move. For 34 seconds, Kwiatkowski averaged 436 watts, or 6.43 w/kg. His average cadence was 83 rpm. Not only are these impressive numbers, but keep in mind the workload he had already put out for over six hours in the saddle. After catching the group, Kwiatkowski took a very short break and sat in. With a narrow lead over the approaching peloton that included many of the favorites, Kwiatkowski couldn’t afford to wait too long. After less than a minute of rest from his big effort, he once again hit the pedals hard and went for the win. His attack lasted around 3 minutes. Again, these numbers are incredibly impressive on their own, but are made more so when you take into account how late in the race they occurred. In the final stretch, Kwiatkowski was being chased by a formidable group looking to catch him on the line. While he was able to coast the final few meters, the last 1.7 kilometers were not a procession for the eventual winner. A rider that regularly uses his Quarq in training and racing, Kwiatkowski knew exactly what he would be capable of on race day. With strong teammates, a smart plan and of course tremendous fitness, Kwiatkowski was able to make the most of this rare opportunity.